Flint Cragley is a Cragnon in the game Super Paper Mario. A celebrity amongst his race, Flint has the highest-rated news program in all of Crag, and is the only Cragnon encountered who wears clothes other than animal skins and who doesn't insert "crag" and "brah" in place of other words. His name derives from Flint (a hard, resilient variety of quartz that was often the material of choice in making stone tools like arrow- and spearheads) and crag (alternatively Cragnon). He bears some resemblance to Indiana Jones (who he is even named after in some translations) and other celebrity documentarians like Steve Irwin. 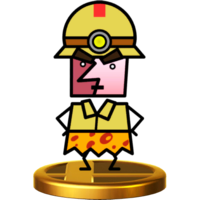 He is also somewhat comparable to Kolorado, from the first Paper Mario, as both are explorers, both are encountered in a cavern, and they both star in Chapter 5 of their respective games. His TV show is called Flint Cragley, Cragtrotter, which is also the name of his theme, according to The InterNed. Mario and his friends first encounter Flint Cragley deep in the depths of Floro Caverns. Missing his crew members, Hornfels and Monzo, Mario and the others seek them out and return them both to Flint. After having his crew returned to him, they are about to unlock a door and advance further into the caverns, but Flint gives the key to Mario's team and has them move on first, instead. Flint and his crew follow Mario and eventually witness the battle with King Croacus IV. After Croacus begins wilting and the truth unfolds as to why he brainwashed Cragnons, Flint promises to show the other Cragnons the videotape to end the war between Cragnons and Floro Sapiens. Despite his reputation, Flint is both sneaky and a bit of a coward. Though he is brave most of the time, when he is knowledgeably heading toward possibly fatal dangers, he attempts to find ways of backing out or at least not going first. This is seen in the very beginning of Chapter 5-4, when he accepts leadership, but suddenly acts as if the player had insisted upon taking the role of leader. Of course, the player has no choice. Contradicting this, Flint and his crew go ahead anyway. After the game is beaten, Flint Cragley can be found making a new rock single entitled, "Songs from the Crag: The Key of Flint." Card Description: It's the star of "Flint Cragley, Cragtrotter"! His show is a smash hit on crag-vision. Wii Super Paper Mario (4/2007) Who would use "Cragley Ho!" as a catchphrase, you say? Flint Cragley, of course! He comes from an advanced Stone Age civilization called the Land of the Cragnons. There they broadcast a program, "Flint Cragley's Cragtrotter," which stars Flint Cragley, is directed by Flint Cragley, and was made possible by producer...Flint Cragley. A freelance explorer, easily identified by his cry of "CRAGLEY HO!" A Cragnon from Crag, which is something like an oddly advanced Stone Age civilisation. Directs and stars in the popular show Flint Cragley's Cragtrotter - the biggest hit on all of crag-vision! Yes, he's quite the celebrity, and he's very aware of that. Debiddo Pun on "David". Likely a reference to the Scottish explorer David Livingstone, his camera crew being named after Henry Stanley in the Japanese version. French Indiana Crag Pun on "Indiana Jones"
German Karl Klippstein "Karl Cragstone"
Italian Cromagno Jones Pun on "Indiana Jones"
Flint Skalli Flint Cragley, but the "crag" part of "Cragley" translated. This page was last edited on October 5, 2018, at 03:38.